St. Patrick's Day balloons, decorations, and costumes. 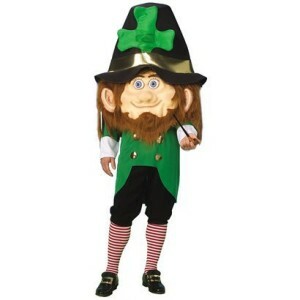 We have balloons, costumes, hats, ties, pins, beads and more for your party, or just because on St. Patrick’s Day everyone is Irish! The St. Patrick’s Day custom came to America in 1737. That was the first year St. Patrick’s Day was publicly celebrated in this country, in Boston. Though originally a Catholic holy day, today, people celebrate March 17 with parades, wearing of the green, and drinking beer. One reason St. Patrick’s Day might have become so popular is that it traditionally takes place just a few days before the first day of spring. One might say it has become the first green of spring. The person who was to become St. Patrick, the patron saint of Ireland, was born in Wales about AD 385. His given name was Maewyn, and he almost didn’t get the job of bishop of Ireland because he lacked the required scholarship. Far from being a saint, until Maewyn was 16, he considered himself a pagan. At that age, he was sold into slavery by a group of Irish marauders that raided his village. During his captivity, he became closer to God. He escaped from slavery after six years and went to Gaul where he studied in the monastery under St. Germain, bishop of Auxerre for a period of twelve years. During his training he became aware that his calling was to convert the pagans to Christianity. His wishes were to return to Ireland, to convert the native pagans to Christianity; but his superiors instead appointed St. Palladius. But two years later, Palladius transferred to Scotland. Patrick, having adopted that Christian name earlier, was then appointed as second bishop to Ireland. Patrick was quite successful at winning converts. And this fact upset the Celtic Druids. Patrick was arrested several times, but escaped each time. He traveled throughout Ireland, establishing monasteries across the country. He also set up schools and churches which would aid him in his conversion of the Irish country to Christianity. His mission in Ireland lasted for thirty years. After that time, Patrick retired to County Down where he died on March 17 in AD 461. That day has been commemorated as St. Patrick’s Day ever since. Much Irish folklore surrounds St. Patrick’s Day. Not much of it is actually substantiated. Some of this lore includes the belief that Patrick raised people from the dead. He also is said to have given a sermon from a hilltop that drove all the snakes from Ireland. Of course, no snakes were ever native to Ireland, and some people think this is a metaphor for the conversion of the pagans. One traditional icon of the day is the shamrock. And this stems from a more bona fide Irish tale that tells how Patrick used the three-leafed shamrock to explain the Trinity. He used it in his sermons to represent how the Father, the Son, and the Holy Spirit could all exist as separate elements of the same entity. His followers adopted the custom of wearing a shamrock on his feast day.